Today I have an ale that has been sitting in my fridge for many months begging to be consumed, so I figure now is as good a time as any. 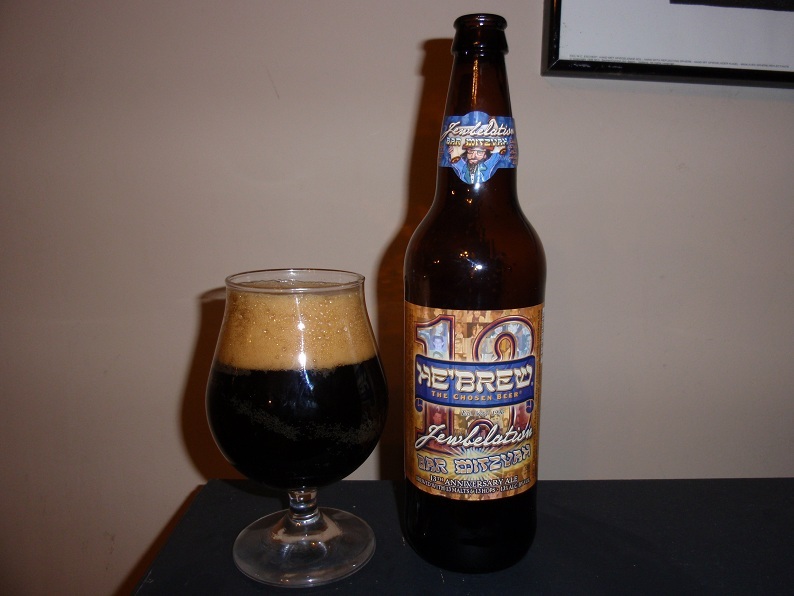 As if their last iterations weren’t enough the fine folks at Shmaltz who produce the He’Brew line of brews have done it again with their 13th Anniversary Ale: Jewbelation 13 – Bar Mitzvah. For a moment lets pretend the 12 hops and 12 malts used in last years Jewbelation weren’t enough so this year they have continued the tradition with 13 hop varieties, 13 malt varieties and allowing this ale to clock in at 13% ABV. I have thoroughly enjoyed He’Brew’s past Anniversary Ales and I hope to feel the same way about this here lucky 13 ale I hold in my hands. Onto the good part. This ale pours with a lovely light creme brown colored head that easily creates over three fingers of tight bubbles that very slowly open fading after four or five minutes leaving a small ring of bubbles around the surface of the liquid. The brew is an incredibly dark amber hue that looks black even when brought to light, allowing no light through except at the very surface of the brew. Aroma consists of a solid dose of alcohol, enjoyable caramel & creme esters, additional gentle sweetness, soft dark pitted fruit notes and moderate bitterness. Flavor is massive and complex. A variety of contrasting flavors are present from sweet creme and chocolate to a myriad of bitter notes including coffee, bitter-sweet chocolate, many roasted malts and a good dose of alcohol. While malty notes are predominate for me in this ale as well as those in the series I have consumed thus far, this one allows the hops to shine through a bit more. A variety of gentle citrus, floral and other fruity hop esters are present throughout, but most notable towards the end of your sip and add a very enjoyable and needed contrast to the massive malt profile of this ale, though not quite as much as I would like. Alcohol is certainly present and notable but provides a nice bourbon accent to the ale and is no surprise considering its 13% ABV. 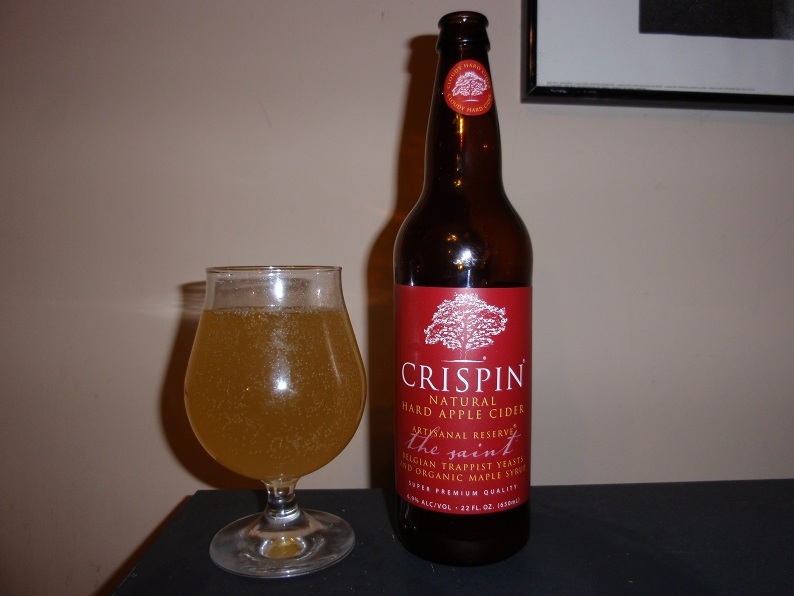 Body is medium-heavy and the mouthfeel is full and quite carbonated. Over all this is one full flavored and incredibly malty bitter ale. I tend to drink my ales (including this one) at just below room temperature and would encourage you to do the same. The closer this ale gets to room temperature the more caramel and pitted fruit esters come out which is quite nice. While I enjoy and sincerely respect the task that He’Brew has set out to do with the last few ales in their Anniversary series this ale really makes me wonder how much longer they can continue with the current trend and manage to create a well balanced ale. Any homebrewer or knowledgeable beer connoisseur knows how difficult it is to manage such a variety of hops and malts and I am always an advocate of experimentation especially on such an intense level but with so many grains and herbs it is difficult to create distinct flavor profiles and I somewhat miss that in this ale. Definitely an incredibly flavorful ale, and one I have enjoyed drinking but unquestionably not an ale for everyone, or even most people. If you enjoy complex, inventive, malty and intensely bitter ales you should certainly allow this ale to tempt you. Give it a shot and ride your bike. Grand Teton Brewing as one might guess is located at the base of the Teton Mountains in Victor, Idaho. Making a number of solid ales including my favorite so far Black Cauldron an Imperial Stout, which I’ve been meaning to write about for some time. 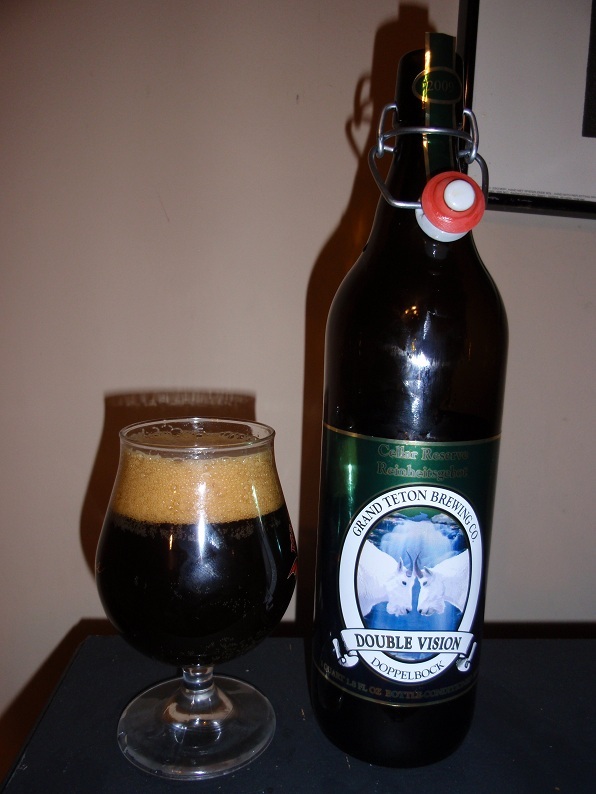 Double Vision is one of four bottled (and one limited draft) ales released in their Cellar Reserve series of 2009. While milling around The Four Firkins during their incredibly packed Unibroue tasting a few weeks ago I got to talking about the Cellar Reserve series with Sean and unable to make up my mind about which one to sample he suggested the bottle I have before me, Double Vision Doppelbock. Packaged in a lovely and very large 1 Quart 1.8 fl oz flip top bottle complete with a fancy tag with an additional description of the brew. Informing us that this ale was brewed to highlight the brewery’s “wonderful glacial spring water and was brewed in strict adherence to the Reinheitsgebot”. Which for those of you who do not know is the German purity law that requires beer to be brewed with only the four fundamental ingredients: hops, malted barley, water and yeast. They further go on to describe their proper bottle conditioning technique (KrÃ¤usening) of blending fully fermented ale with newly fermenting ale to create continued fermentation in the bottle as it ages. As well as some more statistical information such as its date of February 11 2009, its Original Gravity of 24Â° Plato (1.096), 18 IBUs, 8% ABV and last but not least its color of 46Â° Lovibond. If some of those numbers don’t mean anything to you a quick Google search should shed some light. While not necessary I always enjoy when brewers happily share additional information about their brews, be it simple statistics, ingredient information or even a little bit about their process. Onto the good part. This ale pours a very dark amber-brown hue that appears completely black in the glass until brought to light. Head is an attractive light chocolate brown color that starts with almost four fingers of tight silky bubbles that slowly fade leaving you with a small ring of carbonation around the glass but almost no lacing. Smells very much as I like a strong Scotch Ale or Doppelbock to. Full of sweet complex caramel and toffee esters, intense notes similar to malted milk balls, chocolate, soft coffee esters, gentle roasted malts and very light alcohol esters. Flavors are incredibly rich, dark pitted fruit esters are upfront, dates, plums & raisins, followed by a myriad of roasted malt esters, gentle bitterness, semi-sweet chocolate, molasses and a modest does of alcohol, particularly as it warms. Delicate hop esters are present but almost unidentifiable due to the rich dark flavors. With an 8% ABV this ale is appropriately alcoholic but has more than enough flavor to make you forget. Body is heavy and the mouthfeel is wonderfully thick and creamy but surprisingly smooth. Definitely one delicious Doppelbock that any fan of the style should appreciate and further encourages me to sample more of their Cellar Reserve Series. It may also suit the fancy of those into dark Belgian Strong Ales or even complex Scotch Ales. A lovely sipper for anytime of the year, particularly these colder months. Give it a shot and ride your bike. Here I have a lovely ale from a solid brewery that hasn’t been available for very long in our fine state of Minnesota. Mad River Brewing Company out of Blue Lake, CA appears to be a quaint little brewery from one look at their website (which is in the process of a much needed update), but apparently they have been operating since 1989. 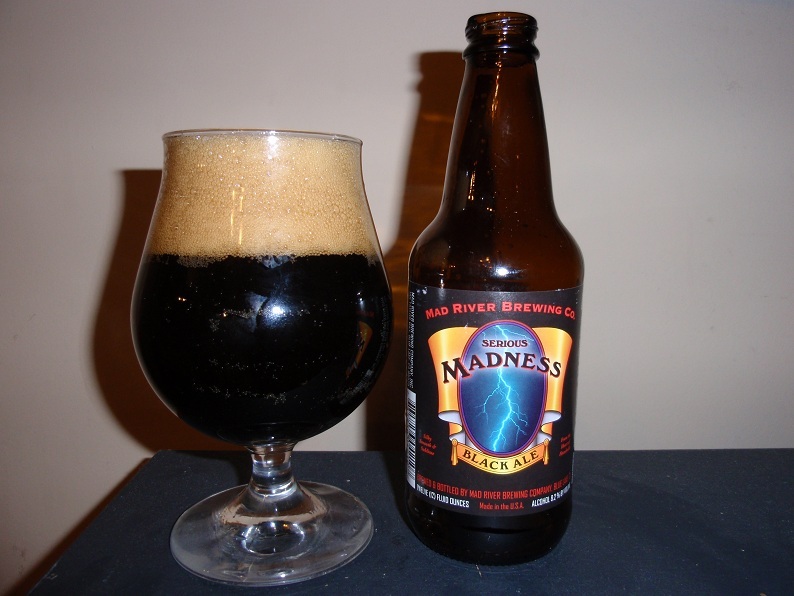 So far I have sampled three of their ales, Jamaica Brand Red Ale which was decent [review], John Barleycorn Barley Ale which is very tasty, and my favorite so far Serious Madness. This ale pours a very dark black hue that is completely opaque, even when brought to light. Head is a solid three plus fingers of creamy milk chocolate bubbles that slowly open and dissipate after many minutes leaving a few solid millimeters around edge of the glass and a modest amount of lacing. Smells of rich dark roasted malts, modest notes of coffee, a very gentle creamy toffee like sweetness and very subtle fruity hop esters. Tastes ofÂ toasty roasted malts, semi-sweet chocolate, gentle coffee esters and a variety subtle fruit & citrus hop notes that are contrasted by strong malty bitterness in the finish. Alcohol is present in the flavor, but considering this brews solid 8.2% ABV it is very subtle, being nicely contrasted by a combination of malty sweetness, malt bitterness, and hoppy citrus & fruit characters. Body is medium and the mouthfeel is smooth, clean and surprisingly light. With the variety of flavors present in this dark ale it manages a very nice balance. A lovely example of the creativity in ales that we are creating in our fine country. If you enjoy strong ales, dark malts and modest amounts of contrasting hops you should dig this ale. A lovely take on a strong dark ale I would highly suggest, particularly once it has warmed up a bit. Give it a shot and ride your bike.